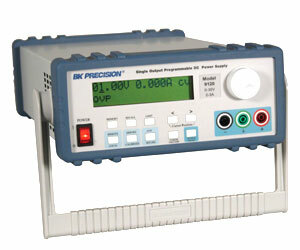 The 9120 series are single output programmable power supplies with built-in RS232 and SCPI language compatibility. They were designed to meet the needs of today s applications in R&D design verification, university labs, production testing, and other applications that require clean/reliable power and excellent performance. With meter resolution of 10mV and 1mA, these power supplies are ideal for low power surface mount circuits that require very precise voltage and current settings.